The Annunciation is a passage in the Bible, the announcement by the angel to the Virgin Mary that she would conceive and become pregnant. This theme would be the most common for Christian art that has been loved by many artists through the ages. 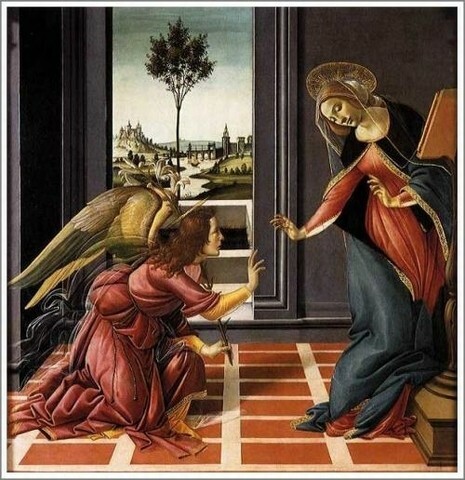 Sandro Botticelli and Leonardo da Vinci, who focused on the revival of classical art during the Renaissance era, created artworks with the theme of the Annunciation. The Annunciation is very rare as it often consisted of common motifs. In any paintings of the Annunciation, the Virgin Mary was depicted on the right and the angel Gabriel was on the left. And the Virgin Mary's clothes are blue and red. It is said that this blue is the color that symbolizes holiness, and red is the color that symbolizes the love of God, which can be often found in images of Jesus Christ. Also, the Virgin Mary was depicted without angels as an exceptional art of the Annunciation. Her expression is quite calm. It can be said in any other paintings that the Virgin Mary who conceived without any man was originally confused and it took time for her to accept the fact. But she decided to accept it as it was God's will. The paintings of the Annunciation can be surely found when you visit to appreciate Christian art. If you view them carefully, it would be interesting to see the commonality.